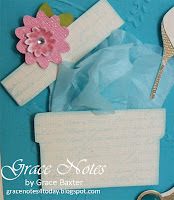 Grace Notes for Today: FABULOUS at 50! When a woman reaches that dreaded number 50, she needs to be celebrated for how wonderful she is! The recipient of this card has so many fine attributes, there is only one word needed to describe her. FABULOUS! 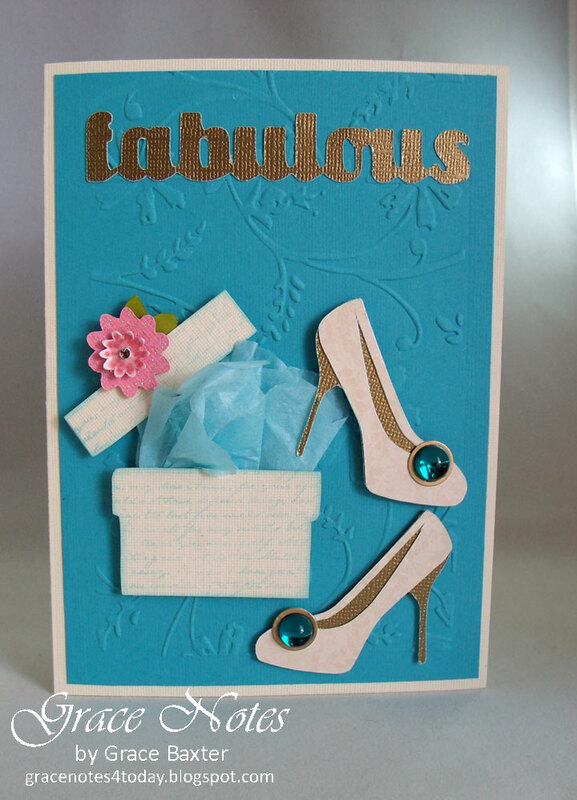 Everything about this card is hand made except for the bling added to the shoes and flower. 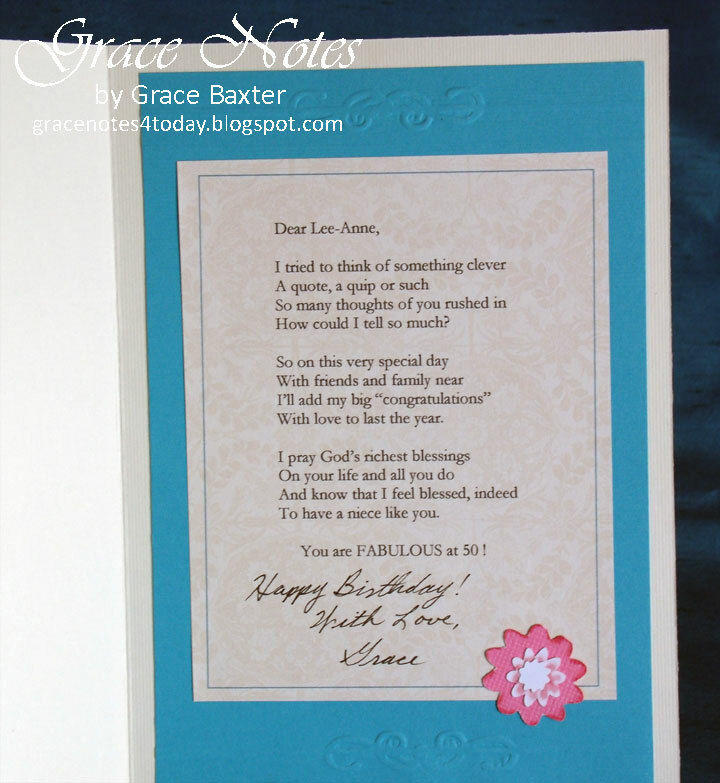 The 5x7" base is cream cardstock that has a linen feel. 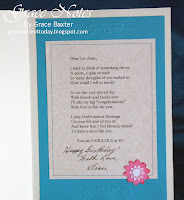 I embossed the turquoise background panel to break up the space. 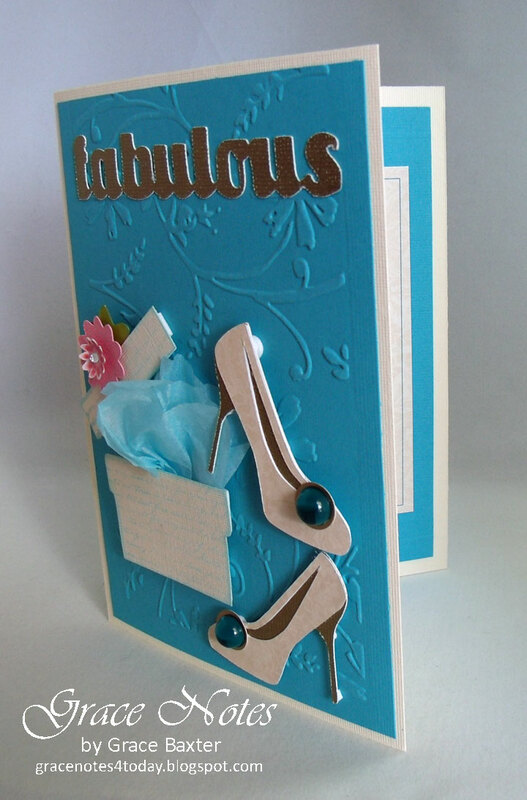 The title, "Fabulous" is cut 4" wide from gold metallic cardstock. The cartridge used for all cuts is Forever Young. My recipient loves shoes. This pair of shoes was cut at 3", with each shoe measuring a hair more than 2". 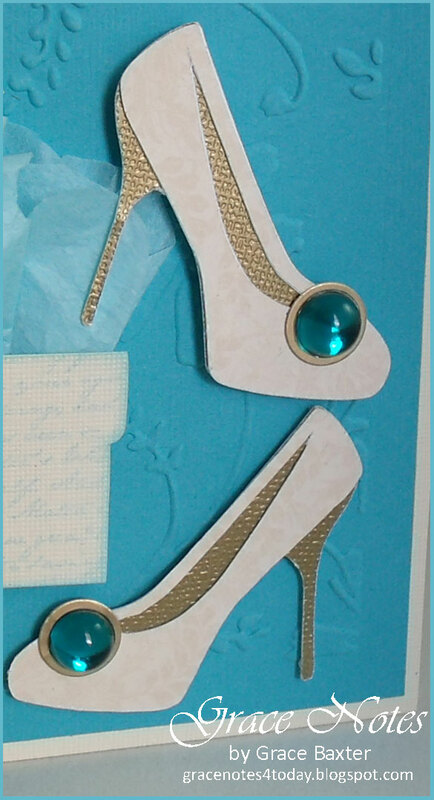 I cut a base from white cardstock first, to see how the large stones would look on that size shoe. Pretty impressive, so I went with that size. The shoes have gold heels and inserts from the same gold metallic as the title. The shoe body is a muted cream design, which doesn't show up well in photos. But the BOX is where I really had fun! It's cut at 2". I altered the shape by cutting the lid off and designing it as a separate piece. Both box and lid are lightly stamped with a script stamp, and inked around the edges. The finished box is quite sturdy, with the lid being thicker. All box pieces are stuck down using thick square foam pops. The original flower cuts out with the box. The large flower layer is cut from sparkly pink. That's obvious. I cut the smaller layer from white, and painted the inner petals only, then blended them out. This step made all the difference in the flower looking more life-like. 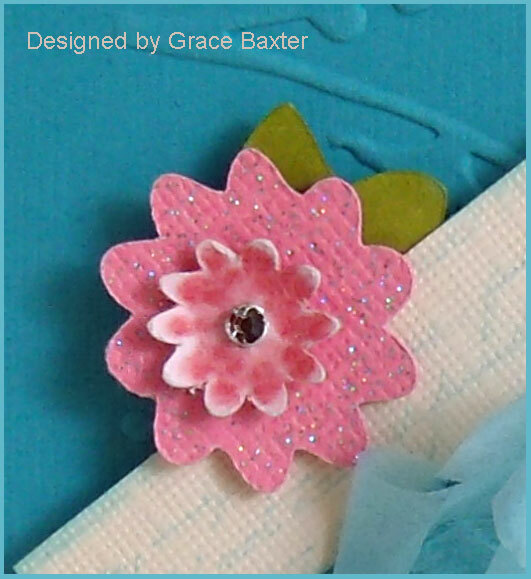 A crystal centre sparkles up the flower and matches the sparkles on the outer petals. The leaves are also white cardstock, painted green. The layers are all separated by and adhered with pop dots. To make the shoe box more realistic, I added puffy tissue, first cut with scallops and gathered together, taped at the back. The poem inside is one I composed especially for my niece. I printed it on the same cream print paper as the shoes, and mounted it on the turquoise. An extra little flower finishes it off. I would definitely describe this card as having "simple elegance". This is just a fabulous card! Love all of the great details. Well done! OMGosh, Grace... What a wonderfully creative card! I Love all the details & such lovely colors, too. Perfection. I'm sure your niece loved it!! !